We are in the midst of a sea change here in the coffeehouse. We have made the difficult decision to have Little Man come on home to do school here, with me. Now, we have been homeschoolers from years ago. School decisions are a per kid, per year, per circumstance decision. Things shift and change all the time, especially with kids…especially with educating kids. What might work well one year, doesn’t the next. What might work badly one year, might be brilliant the next. Thus, we leave the option of change wide open. But, we don’t change without tremendous consideration, prayer, study and evaluation….mostly because I stew about things. But hey, at least it’s not impulsive. Anyhow, all that is to say that we are back to homeschool, for one: my Anthony and third grade. The other kids are all doing great, so they are still at school. He was not. He is a kid with some issues and layers and this year at regular school (and we love our little school)….the new year has not been good. It’s been eroding connections around here and that, well, it’s unacceptable. So last week we made the final decision to bring him home, bring him close. He’s super smart this kid. The academics are not the issue. The attachment is the issue. We think that if he is supported in working through and building attachment and connection (and this conference last weekend totally hammered this home) then he will both mature and be able to fly higher with his school. I’m not willing to accept his frustration escalating and thus his skills and attachment eroding…I”m shooting for gain, for take off. So, for now, he is home. Anthony, first bread ever and it was delicious! Now, can you say “Honeymoon?” I can! Because yesterday, day two, was really tough. So, we had a one day honeymoon. But, while it’s tempting to be discouraged, I’m gonna chalk this whole week up to the choppy waters of changing seas. We, I pray, will find our sea legs. And we will figure out what works and what doesn’t, the timings, the flow. If you have a thought, toss a prayer for us our way. This is important stuff. Sure, the school stuff, the academics, it’s super important, vital. But the connection and heart of this boy? Critical. It’s everything. Day two, messier in every sense of the word….but…it’s a work in progress, right? This entry was posted in Uncategorized and tagged attachment parenting, bread, Empowered to Connect, family life, homeschool, school, therapeutic parenting by coffeemom. Bookmark the permalink. I love that smile! 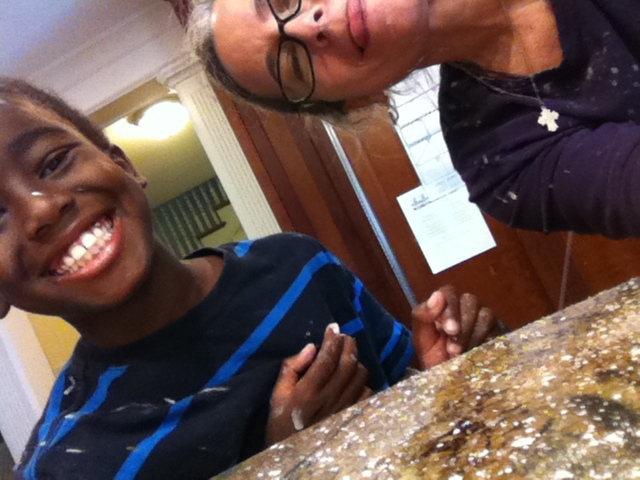 I love that he made bread and it was science, math, and bonding and then finally nurishing. Praying that day 3 is great! I will pray. I know it is/was a big decision to homeschool (again) and you made it because you care so much for the heart of your son. Way to go, Mom! I look forward to reading about the changes and connections that happen! ..But the connection and heart of this boy? Critical. It’s everything. –Yup, couldn’t agree more. I so wish that conference would come this way… I emailed them to ask and they said they were working on it, but it may take some time. 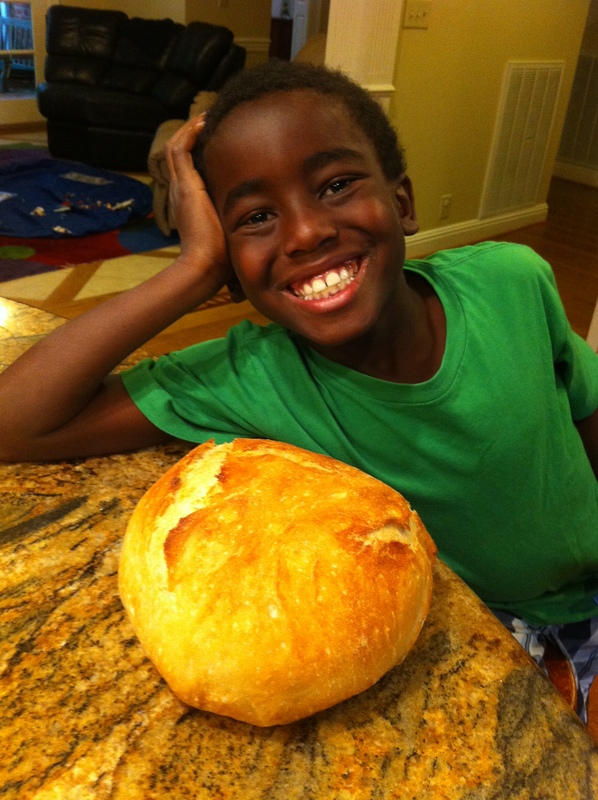 Love that smile — and that looks like the no-knead bread recipe I love! Hope this is the beginning of new deeper connections with this sweet boy. Zoe, that conference IS so good. it’s worth traveling even, I’d say. And you might get a lot out of it after your girls have been home a bit….it’ll come close enough to go to at the right time. It’s excellent, her website w/ clips is too and the videos are good if you can’t get to the real thing. As to the bread, it is! It’s that easy and he didn’t think he could make it; but it was a smashing success. As to the homeschool, it’s a steep adjustment curve, with some rebound behaviors that get worse then better (I hope) but it’s already better and more connections than we’ve had in months. SO, it’s the right thing for now. THank you!